TOff started as a very simple program that was designed to perform power operations at a predefined time. 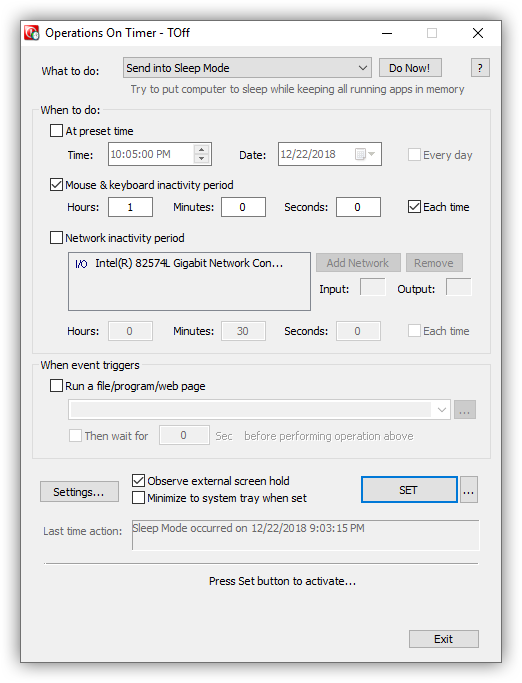 Later we've added some other useful features, such as computer inactivity timers, mouse & keyboard, and/or CPU usage, and network inactivity timers to trigger power operations. The program can be set to run every day or each time Windows user logs in. TOff in the setup mode on Windows 10. When TOff starts, it sets its controls for the previously used power operation, and the time - one hour ahead of the current time. Turn Off Computer (Soft) - Shuts down your computer only if all other running programs allow it, i.e. "clean shut-down". 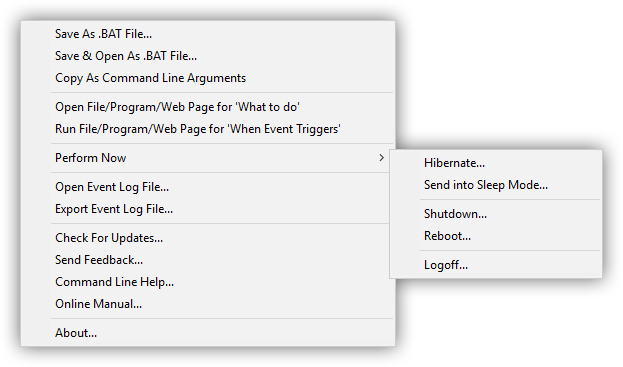 Hibernate Computer (Soft) - Hibernates your computer (i.e., saves the state of all programs running and shuts down) only if all running programs allow it. This option is available in Windows XP only. Hibernate Computer - Hibernates your computer unconditionally. Since it is hibernation programs are not closed. Send into Sleep Mode - Sends your computer into sleep mode (the low power consumption mode) while keeping wake events enabled. Reboot Computer (Soft) - Reboots your computer only if all other running programs allow it. Logoff User (Soft) - Logs off current Windows user only if all other running programs allow it. Open File - Opens a file, runs a program, or a batch script specified in the field below. Use the drop-down list in the Open field to select from previously used files. Or, click the "..." button on the right to bring up a window to locate the file that you want to open. 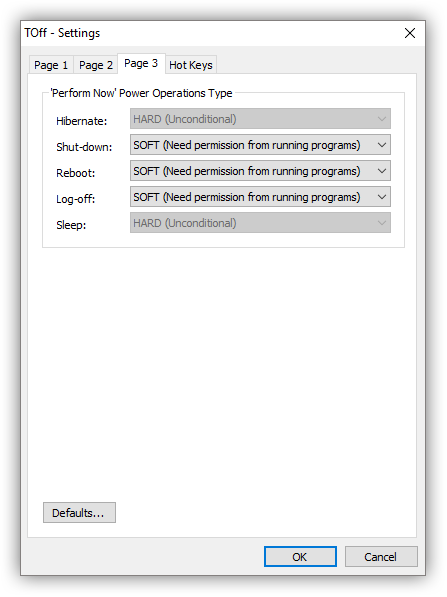 If you need to perform selected operation immediately without timers, click "Do Now!" button. TOff may display a confirmation message before performing the operation. At preset time - Lets you to select time and day when to perform the operation. Specify date and time for the local time zone. Mouse & keyboard inactivity period - Lets you set how much time you allow your computer to be inactive before performing the operation. Computer activity is considered as keyboard and mouse activity. This option can be configured in the Settings, Page 2, "Computer Inactivity Timer" section. This option can be used together with the "Network Inactivity period". 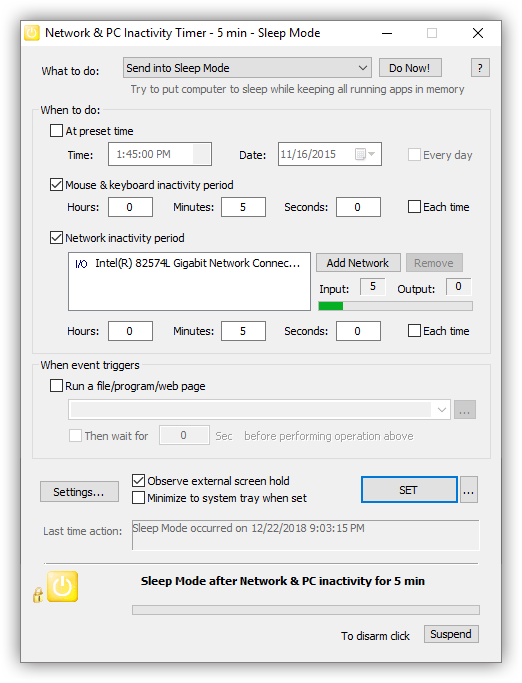 In this case the inactivity timer will be reset in either of two cases: computer activity as described above, or network activity as described below. CPU inactivity period - Lets you set how much time you allow your computer's CPU(s) usage to be below a preset value before performing the operation. CPU usage is measured in percent and is determined on the system-wide range for all installed CPUs. This option can be used together with the "Network Inactivity period". In this case the inactivity timer will be reset in either of two cases: CPU activity as described above, or network activity as described below. Mouse & keyboard and CPU inactivity period - Lets you set how much time you allow your computer to be inactive before performing the operation. Computer activity is considered as one of the following: keyboard and mouse activity, or CPU(s) usage being above a preset level. This option can be used together with the "Network Inactivity period". In this case the inactivity timer will be reset in either of two cases: computer or CPU activity as described above, or network activity as described below. Network inactivity period - Lets you set how much time you allow your network adapter(s) to be inactive before performing power operation. Before activating this timer you must select Network Adapters to monitor network activity on, if one is not selected by default. After clicking "Add Network" button you will see a pop-up window that has a list of all available network adapters. That window also allows to specify the traffic direction to monitor activity on. Check one or two of the following boxes: "Monitor input activity", "Monitor output activity" before clicking "Add" button. When adapter is added, you will see its name and specified traffic direction to monitor activity on in the main window of TOff. A small progress bar on the right will show the activity network stats for all network adapters in the list. To remove a network adapter from the list in the main window of TOff select it first and click "Remove" button. Network activity is considered as the number of packets sent and/or received by the network adapter. TOff will reset the network inactivity timer if a number of packets peaks at or over a specified value. By default this value is set to 3, but you can change it in the Settings -> Page 2 window, or via a command line call. 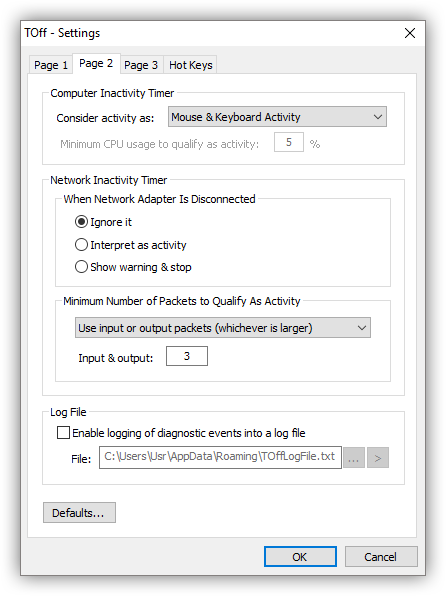 If more than one network adapter is selected to monitor network inactivity, TOff will use the bigger packet number for the activity count. If you want the operation to be performed "Every day" at a Preset Time, or "Each time" current Windows user logs in, check the appropriate box. By enabling these options you allow TOff to write itself into the Windows Autostart Registry key, which will run TOff each time you re-boot your computer or when current Windows user logs in. To disable this feature, close TOff, or reset it with this option checked off. To run a program, open a document, or a web page right before specified operation triggers, check "Run a file/program/web page" box. It will allow you to specify a file path or a URL for the document of interest. In case of the file being on your local computer use the "..." button on the right to select it from the Open File window. In case of a web page, precede it's URL with the http://, https:// or other web resource denominator. By default TOff will wait for the specified file and/or document to initialize before continuing on. You can change this in the Settings -> Page 1 window. In case you specify a document or a file to run, you can also make TOff wait before performing power operation. To do so, check the "Then wait for" box first, and then specify the number of seconds to wait. During this time TOff will simply wait before performing specified power operation. To change persistent settings for TOff, click the "Settings" button. You can change settings only before you activate TOff. To enable TOff to track the external screen or system hold, check "Observe external screen/system hold" box. Note that while enabled, this option may indefinitely postpone scheduled actions in TOff. This option can be configured to track only screen, or only system hold, or both in Settings -> Page 1. TOff will indefinitely postpone its scheduled actions. When TOff detects that external power saving hold was lifted, it will resume its scheduled actions by resetting its inactivity timer. If you would like to minimize TOff to the system tray right after it is set, check "Minimize to system tray when set" box. System tray is the area next to the Windows system clock. By minimizing TOff to the system tray you save space on the screen, while keep TOff still running in the background. Click "Set" button to activate, or "Change" button to change already activated state. IMPORTANT: Only after you click Set/Change button your settings for TOff will take effect! To prevent unexpected operations and deadlocks some low timer settings are not allowed. In case you selected to minimize TOff to the system tray this window will not be visible. Now simply let TOff run, or minimize it away from the desktop. You can specify in the Settings that closing the TOff main window will minimize it to the system tray. INFORMATION: Screen activity, as well as plugging in and unplugging USB devices (including insertion and removal of Jump drives and Flash memory cards) are not considered as "activity" and thus will not reset inactivity timer in TOff. In this case you may consider using CPU inactivity period. In case you decide to change any of the operation parameters (timer type, day, time, or operation type) you can do so in the main TOff window. After that remember to click "Change" button to apply changes. The information about operation will change at the bottom of the TOff window. IMPORTANT: Changing TOff controls without clicking the "Change" button will not reset it for the new schedule! To prevent a possible confusion, enable the setting to "Disable controls in the main TOff window when it is activated" in Settings -> Page 1. To disarm, or cancel TOff, hit "Suspend" button in the bottom right corner, or select Suspend or Exit from the system tray icon menu. If you suspend TOff, the scheduled operation timer will be stopped and you will be able to change its controls and reset later on. In case operation succeeded, you will see a message like this, "Soft hibernation occurred on 01/14/2004, 21:25", which tells you the exact time the operation took place. In case operation failed, a message like this one will be displayed, "Soft hibernation ERROR on 01/14/2004, 21:25", and the icon in the bottom left corner will show an error icon. In case a user canceled the operation when TOff was triggered you will see a message like this, "Soft hibernation CANCELED on 01/14/2004, 21:25", and the icon in the bottom left corner will show the information icon. In case Soft power operation was selected and TOff was not able to hibernate computer as one or more of running programs did not allow it, you will see a message like this, "Soft hibernation NOT ALLOWED on 01/14/2004, 21:25", and the icon in the bottom left corner will show the information icon. Save As .BAT File - Opens up a window that lets you pick location on your disk drive to save the current selection of controls in the TOff main window into a Window batch (.BAT) file. This could be useful in case you need to run TOff with the same settings again. To do so, one needs to simply run the resulting batch file from the Windows Explorer, or any other program. Running a batch file while another instance of TOff is on will have no effect. When saved each batch file contains additional non-executable Command Line Helper information attached to the bottom to facilitate editing of the command line at the top. Each line of the batch file that starts with REM is a non-executable line that can be omitted. Save & Open As .BAT File - Opens up a window that lets you pick location on your disk drive to save the current selection of controls in the TOff main window into a Windows batch (.BAT) file, and later open this file in the Notepad to allow user editing. This could be useful in case you need to run TOff with the same settings again. To do so, one needs to simply run the resulting batch file from the Windows Explorer, or any other program. Copy As Command Line Arguments - Copies the current selection of controls in the TOff main window onto Windows Clipboard as command line arguments. Open file/Program/web page for 'What to do' - Will attempt to run a program, open a file, or a web page specified for "What to do" option on top of the TOff window. This option is available only if "Open File" is selected in "What to do" drop-down control. Run file/Program/web page for 'When Event Triggers' - Will attempt to run a program, open a file, or a web page specified to run when event triggers. This option may be useful to test a scheduled event before it is triggered. Hibernate - will hibernate the system. This option will issue a user warning before performing a power operation. Send into Sleep Mode - will send system into sleep mode. Shut-down - will shut-down the system. Reboot - will reboot the system. Logoff - will log off current Windows user. Open Event Log File - opens up for viewing diagnostic event log file. This option is available only if logging of diagnostic events is enabled in the Settings, Page 2, "Log File" section. Export Event Log File - opens up a window that will let you select a folder on your disk drive to save a copy of the diagnostic event log file. Check For Updates - opens up our website that will let you see if an update for your version of TOff is available. Internet connection if required for this option to work. Send Feedback - opens up our website that will allow you to submit your feedback about the TOff software. Note that even though we accept bug reports and general suggestions for improvement, we do not provide technical support for our free software. Command Line Help - opens up a window with a brief description of command line parameters. A more complete manual of command line parameters is provided in this manual. About - Opens up a window with information about your copy of the TOff program. Multi-user safe mode (Windows XP, or later OS) - To run TOff in a Multi-user Safe Mode, check this box. When activated in this mode TOff makes sure that scheduled operation happens only when the Windows user who set it up is logged in. If another user is logged in at the time of the operation, TOff will show a warning. Windows Vista & later OS: This mode is always on. Close button works as "minimize" when TOff is activated - when checked will make TOff minimize to the system tray if user clicks the close button in the title bar of its main window and TOff schedule is activated. If unchecked, TOff will stop the scheduled operation and exit. Disable controls in the main TOff window when it is activated - when checked will make TOff disable most of its controls in the main window when the schedule is activated. Those controls will be activated back when TOff schedule is suspended. Play sound beep warnings before scheduled power events - when checked will play warning sound beeps before performing power operation. Sound beeps N sec before performing power operation - allows to specify how many seconds to start playing warning sound beeps before performing a power operation. Warning screen N sec before performing power operation - allows to specify how many seconds to show a warning screen before performing a power operation. A warning screen will also try to wake up computer monitor to signify imminent operation. Perform power op if scheduled time is earlier than current time - when checked will perform a power operation even if current time is later than the scheduled time. WARNING: Even though this option seems like a logical one be aware that it may lead to a confusing situation. Picture this - you set up a hard shut-down for 11:00 pm on Sept. 1st. For some reason you hibernate your system before that and wait until Sept. 2nd to wake it up. In this case, with this setting enabled, TOff will perform hard shut-down as soon as you resume your system!. Cancel power op if scheduled time is earlier than current time - more than - when checked will cancel power operation if current time is later than the scheduled time more than the specified time interval. Suggestion: This option should be enabled to prevent "overexposure" of the scheduled power operation. Read explanation above. Display message box if operation is canceled or not allowed - if checked will make TOff to display a warning message box if power operation was canceled due to the reasons explained above. Do not wait for program - this option will make TOff not to wait after it runs an executable program. Wait for program to initialize before continuing - this option will make TOff wait for the program to initialize before continuing. Initialization times vary for every program. Initialization is normally considered complete when the program's user interface is displayed on the screen. WARNING: This option must not be used for console applications. Wait for program to exit before continuing - this option will make TOff wait for the program to exit before continuing. WARNING: This option will block the schedule in TOff for as long as the program it waits for is still running. WARNING: This option must not be used for GUI applications that may display user interface since it may indefinitely deadlock the schedule in TOff. Show error and pause in case cannot run a program or open a file - when a file and/or program specified to run before a power operation cannot be found and/or run, this option will make TOff to show a warning message and pause for the user input before continuing on. Select this option if results of running a program (or opening a file) have a priority over performing a scheduled operation. Screen & system hold - will make TOff track either screen or system power saving hold that may be imposed by other running applications. Defaults button - lets you reset controls on this page of the Settings window to their defaults. Make sure to OK the Settings window to save changes. CPU usage - The overall system-wide CPU usage will be considered as activity. In case of multiple CPUs, TOff will use cumulative CPU usage for all of them. Mouse & Keyboard Activity - Keyboard strokes & mouse clicks and moves will be considered as activity. Mouse & Keyboard Activity and CPU usage - Keyboard strokes & mouse clicks and moves, and the overall system-wide CPU usage will be considered as activity. Minimum CPU usage to qualify as activity - For the CPU usage option, allows to specify the minimum CPU usage value (in percent) to consider as activity. Ignore it - do nothing and continue monitoring remaining network adapters. Show warning & stop - TOff will show a warning message and stop the timer. Use input or output packets (whichever is larger) - TOff will treat input and output packet count as one, thus not making any distinction between them. The "Input & Output" field below will let you specify the actual minimum number of packets. Use input & output packets separately - TOff will count input and output packets differently. The "Input only" and "Output only" fields will let you specify the actual minimum numbers of packets. Enable logging of diagnostic events into a log file - when checked enables TOff to record technical information into its event log file during the operation. This will facilitate debugging of a possible issue with your schedule. The maximum length of the event log file is 1000 lines. If the event log file grows larger than that it will be automatically truncated with the older records removed. Our support team may request you to enable this option to diagnose a possible problem that you may be experiencing. TOff does not collect any of your personal information in its event log file. File - field allows you to specify a path for the event log file. Use "..." button on the right to specify the path for the event log file. IMPORTANT: DO NOT use removable media or network shares for the event log file. Doing so may log inaccurate results when those drives are not available when your system enters or leaves power states. ">" button - opens the event log file for viewing in a web browser, when availble. To save the contents of the event log file, first close the Settings window, then right-click the main TOff window and select "Export Event Log File" from the context menu. This option allows to specify soft or hard power operation type. The soft power operation polls other running programs for whether or not they have unsaved user data, and if yes, the operation is usually aborted. The hard power operation is performed unconditionally, which may lead to the loss of unsaved user data! Hibernate - allows to select soft or hard hibernation. Windows Vista & later OS: Hibernation is always performed as a hard (or unconditional) power operation. Shut-down - allows to select soft or hard shut-down. Reboot - allows to select soft or hard rebooting. Log-off - allows to select soft or hard Windows user log-out. Sleep - allows to select soft or hard sleep mode. Windows Vista & later OS: Sleep is always performed as a hard (or unconditional) power operation. Use key - check this box to enable the hotkey. Hotkey control - llows you to define the hotkey you want to use. To define it, press any combination of keys on the keyboard that you want to use. Besides plain letter and number keys you can also use a combination of Shift, Ctrl and Alt keys. WARNING: Make sure that the shortcut key combination is not already taken. Assigning a hotkey to an already existing shortcut can create confusion. Stand-by (Soft) - sends system into sleep mode. Windows Vista & later OS: This operation is always performed as (HARD) sleep. Stand-by (HARD) - sends system into sleep mode unconditionally. Hibernate (Soft) - hibernate system. Windows Vista & later OS: This operation is always performed as (HARD) hibernation. Hibernate (HARD) - hibernates system unconditionally. Shut-down (Soft) - shuts down system only if all user data is saved. Shut-down (HARD) - shuts down system unconditionally. WARNING: This option may lead to the loss of unsaved user data! Reboot (Soft) - reboots the system only if all user data is saved. Reboot (HARD) - reboots the system unconditionally. Log off (Soft) - logs off currently logged in Windows user only if all user data is saved. Log off (HARD) - logs off currently logged in Windows user unconditionally. Add File - opens a window that allows to locate the file. It then adds its full path to the path control for the hotkey. This option adds selected file path to the cursor location in the path control. It does not remove previous contents of the path control. Replace File - opens a window that allows to locate the file. It then puts its full path into the path control for the hotkey. This option replaces previous contents of the path control with a new path. Clear File Path - erases the contents of the path control. Run Only If Not Already Running - checkbox that can be checked or unchecked if the path control specifies an executable program. If checked, TOff will add an asterisk (*) in the beginning of the file path that will denote that TOff should not run more than a single instance of this program. When unchecked, TOff will run as many instances of that program as it allows itself to run. Note that some programs can limit themselves whether or not they allow more than a single instance to run at the same time. This option can be used only with executable programs. Run File/Program/Web Page - executes the command provided in the path control. Reset TOff - if TOff operation timer is currently activated, this hotkey resets it, which is analogous to a detected activity. 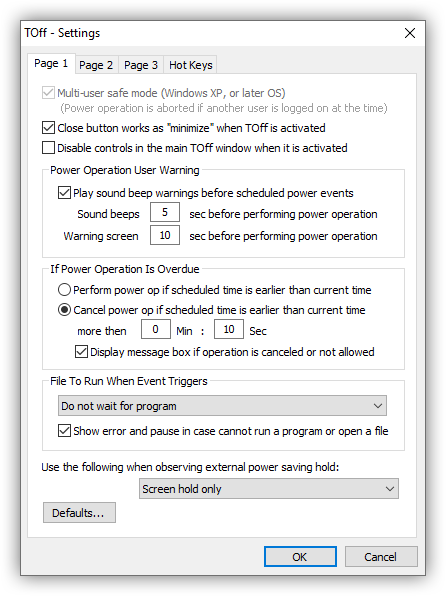 Suspend TOff - if TOff operation timer is currently activated, this hotkey suspends it, which is analogous to a user clicking "Suspend" button in the main TOff window. 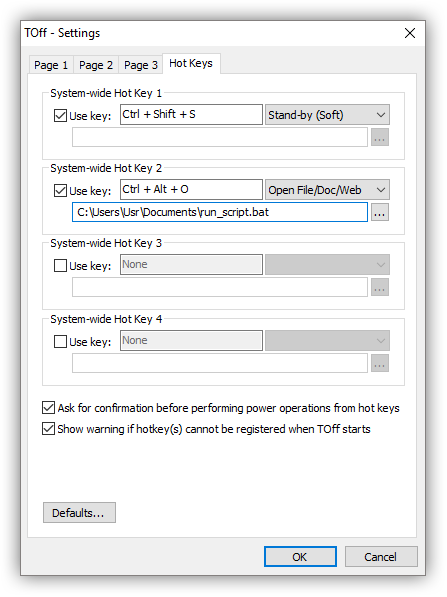 Ask for confirmation before performing power operations for hotkeys - check this box to make TOff show a user confirmation before performing power operations for the hotkeys defined on this page. If unchecked, no confirmation will be shown and the power operation will be executed silently. This setting does not apply to hotkeys that don't deal with power operations. Show warning if hotkey(s) cannot be registered when TOff starts - check this box to make TOff show a user warning if it fails to register any of the hotkeys defined on this page when it starts. If unchecked, no user warning will be shown. /run - Should be specified to run TOff from the command line. /systray - Instructs to minimize TOff window to the system tray. todo - Operation to perform. One of the following is accepted: sh = Shut-Down (Hard); ss = Shut-Down (Soft); hh = Hibernate (Hard); hs = Hibernate (Soft); sb = Send into Stand-by; rs = Reboot (Soft); rh = Reboot (Hard); ls = Logoff (Soft); lh = Logoff (Hard); of = Open file/Program/Web page. If nothing specified, Stand-by is used instead. type - Type of the timer to use. One of the following is accepted: pt = Preset Timer ('tm' and 'dt' parameters will be used); ip = PC/CPU Inactivity Period ('wait' will be used); nip = Network Inactivity Period ('wait' will be used); pcnip = PC/CPU and Network Inactivity Period ('wait' will be used). If nothing specified, Preset Timer is used instead. ofile - Used only if 'todo' is set to 'of'. File/program path, or a website URL to open for the operation. %s - can be either a relative or a full path to the file. Preceed it with http:// or https:// to open a web page. In case of an executable process, precede it with an asterisk (or *) to run it only if no other instance is running. dt - Sets the date to perform operation in 'todo'. Valid only if 'type' is set to 'pt'. In "%f" format it sets static date, where %f = date in local format (Example: "12/25/2008" for US format). In "+%d" format sets date relative to today's date. (Example: "+1" will set the date for tomorrow.) If this parameter is not specified, today's date is used instead. If today's date coupled with time makes the past time, tomorrow's date is used instead. tm - Sets the time to perform operation in 'todo'. Valid only if 'type' is set to 'pt'. In "%t" format it sets static time, where %t = time in local format (Example: "12:00 pm" for US format). In "+%h:%m:%s" format it sets time relative to the current time. If only two values are used, first one is interpreted as minutes and second one as seconds. In case of only one value it is interpreted as relative number of seconds. (Example: "tm=+1:30", will set time 1 minute and 30 seconds ahead of the current time.) If this parameter is not specified, the current time plus 1 hour is used instead. The minimum difference between requested and current time could not be less than 3 minutes. wait - Sets time interval for the period of inactivity before performing operation in 'todo'. Valid only if 'type' is set to 'ip', 'nip', or 'pcnip'. %h = Number of hours; %m = Number of minutes; %s = Number of seconds. If this parameter is not specified, 20 minutes is used instead. where NetworkNameN = Full or partial name of network adapter; i = Monitor input packets only; o = Monitor output packets only; io = Monitor input & output packets (also used by default). Specifies which network adapter(s) to use for monitoring inactivity. If this parameter is not specified, the first active network adapter is used for input & output packets. runfile - Sets a file/program path, or a website URL to open when event triggers. %s - can be either a relative or a full path to the file, or precede it with http:// or https:// to open a web page. In case of an executable process, precede it with an asterisk (or *) to run it only if no other instance is running. thenwait - Used only if 'runfile' is specified. %s = Number of seconds to wait after event triggers and before performing power operation. /eachtime - Makes TOff start with these settings each time when current Windows user logs in. If this parameter is not specified, TOff removes itself from Windows Autostart. WARNING: Use this parameter with caution as it can deadlock your system if you program TOff incorrectly. /everyday - The same as '/eachtime' parameter. /musm - Multi-User Safe Mode, if enabled won't allow a scheduled operation to be performed if another Windows user is logged in at the time. /silent - Makes TOff omit sound warning beeps before performing power operations. donow - Performs power operation immediately. %s = could be: sh = Shut-Down (Hard); ss = Shut-Down (Soft); hh = Hibernate (Hard); hs = Hibernate (Soft); sb = Send into Stand-by; rs = Reboot (Soft); rh = Reboot (Hard); ls = Logoff (Soft); lh = Logoff (Hard). No other parameters are used. /closeall - Closse all running instances of TOff & cancels all schedules in them. No other parameters are used. nitd - Specifies what to do when network adapter is disconnected (used if 'type' is set to 'nip' or 'pcnip'). It could be set to one of the following: i = Ignore; ia = Interpret as activity; sw = Show warning & stop. mnptype - Defines which method to use to determine minimum number of packets to qualify as network activity. %n = can be either: 0 to use 'nitmnp' parameter (assumed by default), or 1 to use 'nitmnpi' and 'nitmnpo' parameters. nitmnp - Used if 'mnptype' is set to 0, or is not specified. Minimum number of input or output packets to qualify as network activity, whichever is larger (used if 'type' is set to 'nip' or 'pcnip'). %n = Acceptable values are 1 through 999999.
nitmnpi - Used if 'mnptype' is set to 1. Minimum number of input packets to qualify as network activity (used if 'type' is set to 'nip' or 'pcnip'). %n = Acceptable values are 0 through 999999. If set to 0, or omitted, the input packets will not be used. nitmnpo - Used if 'mnptype' is set to 1. Minimum number of output packets to qualify as network activity (used if 'type' is set to 'nip' or 'pcnip'). %n = Acceptable values are 0 through 999999. If set to 0, or omitted, the output packets will not be used. /pwdclose - Password to suspend activated instance of TOff. (It is not used if TOff is not activated.) %s = Password to use in plaintext. Alternatively you can scramble the password using the ScramblePwd tool. /? - Displays information window. Sets the time to perform operation in 'todo'. Valid only if 'type' is set to 'pt'. In "%h:%m:%s" format it sets static time, where %h = Hour number in military (or 24-hr) format; %m = Minute; %s = Second. In "+%h:%m:%s" format it sets time relative to the current time. If only two values are used, first one is interpreted as minutes and second one as seconds. In case of only one value it is interpreted as relative number of seconds. (Example: "time=+1:30", will set time 1 minute and 30 seconds ahead of the current time.) If this parameter is not specified the current time plus 1 hour is used instead. The minimum difference between requested and the current time could not be less than 3 minutes. If any of the parameters specified in the command line are not valid or may present potential deadlock of the system, TOff will block operation and display error message. toff /run /systray todo=sb type=pt tm="2:30 am"
Multi-user safe mode is when TOff makes sure that the Windows user who set up a schedule in TOff is the user that is logged in & active when the power operation triggers. Otherwise the operation is aborted. toff /run /systray todo=hs type=ip /pcactivity wait="1:0:0" /musm runfile="https://google.com"
toff /run /systray /eachtime todo=hs type=pt tm="23:00" dt="12/1/2006"
Scrambled password was generated by the ScramblePwd tool. toff /run /systray todo=rs tm="7:00 am" /musm /everyday /pwdclose="xpd:'4PMBAAAA0Iyd3wEV0RGMegDAT8KX6wEAAACkhHtEZUqSQYEHXfhP4fcIBAAAAAIAAAAAABBmAAAAAQAAIAAAADY2JTBtyUBFraWHoAHPfzY50Y4EsgjyPVfs4lj2zCZDAAAAAA6AAAAAAgAAIAAAAPwzfr3UcsRqOfetAPjoXsSEczcUo7fbk2PRg5DUZTDmEAAAAJQidnBb7DOwLRr0gdZVd3FAAAAAKp5ddOBizEd6go4UwzQ4gWh1d/rSvKGS569GQ8eKTp6CUk1XVKNGqMM5Jmp9mybo5DSBcUv40/Oo5Tdbo1/O0zzU'"
SUGGESTION: We strongly recommend to test your schedules in TOff before leaving it on its own. Due to different settings and hardware configurations some operations may not perform correctly on your particular system! Thank you for using TOff!